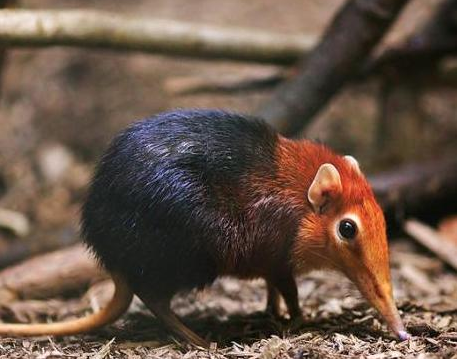 Elephant Shrew, a family of small-sized mammals found exclusively in Africa. Elephant Shrew known as the jumping shrew and can hop like rabbits using their long back legs.The family is made up of four genera and about 20 different species. Elephant shrews has a long, narrow snout, brownish with white underparts and have a white ring around each eye. Elephant Shrews live in grasslands, forests, rocky regions. Elephant shrews are very wary and well camouflaged animals, and are able to run away from danger extremely quickly. Body length ranges from 3.5 to 12 inches (9 to 30 cm), not including the 3.2- to 10-inch (8- to 25-cm) tail. They are very active mostly during daytime and are always out for food hunting during daytime.